Bacterial infections (often Staphylococcus) take hold in small wounds on the feet (received from splinters, glass, frostbite, etc.) especially if droppings have been allowed to accumulate. Prompt antibiotic treatment is necessary if surgery is to be avoided; if left untreated, gangrene will set in, resulting in loss of the foot. Can result from perching on perches that are too hard, or that do not vary in width. Be sure main (roosting) perch is of a width that allows toes to extend ¾ of the way around. Other perches should be of varying widths and materials; including A & E Rope and Cable Perches and similar perches allow the bird to choose a soft surface on occasion. Concrete perches should not be used as main perch but rather only as accessory perches, i.e. near the food bowl (and not at all if calluses are present). Caused by a v iral infection (Polyomavirus), French moult usually afflicts young parrots. It is rarely fatal but bird may be unable to fly thereafter. There is no known treatment; recovered birds may still harbor the virus and thus should not be bred. 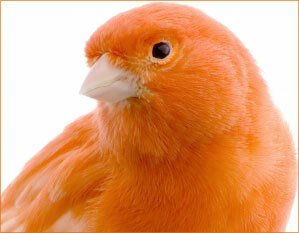 Most common in canaries, this condition is genetic and the result of inbreeding. Incurable; care should be taken to avoid breeding related birds or related lined of birds to each other. The parasites responsible for these conditions may be spread by other birds (in the case of mites) or through foods, such as earthworms, that may harbor gape worms. Ivermectin and other anti-parasite medications are effective treatments. Infected birds should be isolated from others. This bacterial (Clamydia) disease is readily transmittable to people and can be fatal. Contact your family doctor and veterinarian immediately. This bacterium can be spread by roaches, rodents, wild birds, infected pet birds and seed contaminated with rodent droppings, and is most common among birds kept in unclean and crowded situations. Salmonella is readily transmitted to people, and may be fatal to very young, elderly or immune-compromised individuals. Veterinarian-administered antibiotic treatments are often effective. This fungal disease usually occurs in the presence of Vitamin A deficiencies, and is most commonly seen in nectar feeding birds (lories, hummingbirds, sunbirds). Antibiotics and Vitamin A supplements are usually effective. The inability of a female bird to pass an egg is usually the result of a calcium deficiency. Although lubricants applied to the cloaca (vent) sometimes help, veterinary intervention is usually required. A well-balanced diet that includes the correct amounts of calcium and other minerals is particularly important for females of all species. Cloacal warts are most commonly seen in South American parrots, particularly Amazons and macaws. They may constrict the cloaca, causing constipation and preventing the bird from breeding. Silver nitrate (bathing the affected area) cures the condition, but afflicted birds should not be allowed to breed until they have been wart-free for at least 1 year.